One of the widely accepted facts about human beings is, No two people are alike, whether in terms of physical appearance (i.e. body structure, height, weight, colour, etc) or abstract aspects (like intelligence, attitude, personality, behaviour and so on). Many people take a person’s attitude as their behaviour. Although directly or indirectly they are interrelated, they are different in the sense that attitude represents how a person thinks or feels about someone or something. On the other extreme, behavior represents an individual’s reaction to a particular action, person or environment. 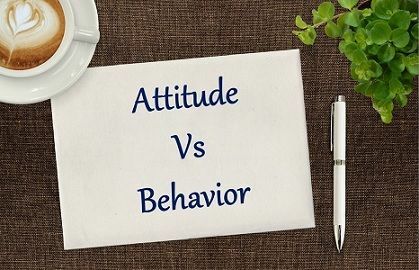 It has been said that ‘a person’s attitude affects thoughts while his/her behavior affects actions.’ So, in our today’s topic, we are going to explore some significant differences between attitude and behavior. Meaning Attitude refers to a person's mental view, regarding the way he/she thinks or feels about someone or something. Behavior implies the actions, moves, conduct or functions of an individual or group towards other persons. What is it? A person's mindset. Outward expression of attitude. Reflects What you think or feel? What you do? To put simply, attitude is a person’s mental outlook, which defines the way we think or feel anything. It is a hypothetical construct, i.e. whose direct observation is not possible. It is a predisposition to respond in a settled way to a person, event, opinion, object, etc., which is reflected in our body language. It has a strong impact on our decisions, actions, stimuli, etc. Education, experience, and environment are the major factors that affect a person’s attitude. A person’s attitude can be positive, negative or neutral views, which shows one’s likes and dislikes for someone or something. So, the type of attitude we carry, speaks a lot about us, as we get into that mood and transmits a message to the people around us. There is no such thing like ideal attitude, for a particular situation as it is spontaneous and so we always have a choice to opt the right attitude for us. The term ‘behavior’ can be described as the way of conducting oneself. It is the manner of acting or controlling oneself towards other people. It is the range of actions, responses, and mannerisms set by an individual, system or organization in association with themselves or their environment, in any circumstances. In short, behavior is an individual or group reaction to inputs such as an action, environment or stimulus which can be internal or external, voluntary or involuntary, conscious or subconscious. Attitude is defined as a person’s mental tendency, which is responsible for the way he thinks or feels for someone or something. Behavior implies the actions, moves, conduct or functions or an individual or group towards other persons. A person’s attitude is mainly based on the experiences gained by him during the course of his life and observations. On the other hand, the behavior of a person relies on the situation. Attitude is a person’s inner thoughts and feelings. As opposed to, behavior expresses a person’s attitude. The way of thinking or feeling is reflected by a person’s attitude. On the contrary, a person’s conduct is reflected by his behavior. Attitude is defined by the way we perceive things whereas behavior is ruled by social norms. Attitude is a human trait but behavior is an inborn attribute. So, with the above discussion, it is clear that whatever you say or do, conveys a message to the world about what’s going on in your mind. It is universally accepted fact that our emotions, opinions and thoughts cannot be observed, which shows our attitude. Further, our behavior is ruled by our attitude as his actions are the reflection of his thoughts. While attitude is nothing but a person’s perception on something or someone in life. As against this behavior, is how a person reacts to various inputs and stimulus. Gotten full of clarity. Thanks for Key Differences. And I wonder if I find search option in this site to access other differences also. Very nice and precisely written. Thanks for sharing such a wonderful information. Thank you for the very clear messages and it will help me explain the difference between attitude and behavior. I appreciate the others expressions of satisfaction in this website. Thank you for the clarity you have provided in explaining the differences between two very close and often mis used descriptions of how we present ourselves to others. Wonderful article. It is very precise and informative. Thanks and wish you best of luck. Thanks for clarity between two concepts.